Pyrenees Quarries manufacture and fit bench tops, vanity units etc in natural granite, marble or composite stone to your specifications. We can readily supply most polished or honed stone types and composites. Our units are fashioned to your template, with edge type of your choosing. The cost of natural stone bench tops may be far less than you think. Fax or Email your design and dimensions to us for a free quote. 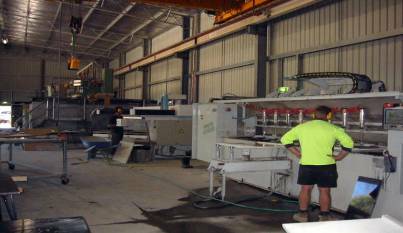 Pyrenees Quarries – Suppliers of Stone Products. Pyrenees Quarries stock a wide selection of polished granite, marble and travertine slabs with a particular emphasis on Australian granites, for sale in slab form or cut and profiled to your specifications. Extensive displays, samples and stone slabs may be viewed onsite. Most stone types available in tile, random or flagstone also are also available in slab form, suitable if required for cutting to suit specific purposes such as table and BBQ tops, pool capping, etc. A wide variety of granite, marble and composite stone offcuts are available – suitable for kitchen tops, vanities, shelving, cutting boards, BBQ tops etc, if we have suitable pieces for your project this can be a cheap alternative.